Ahhh…3 day weekend, we meet again. This Friday Foxy and I are putting up our Out of Office replies and getting an early start to the weekend in VT. Why the vacation day? We are heading up to Stowe & Jay Peak to visit my brother and sister in law. 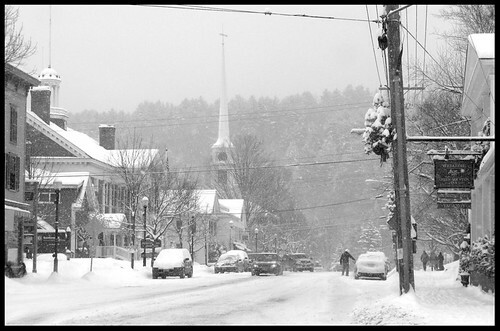 My bro and sis in law are luck enough to live in the adorable town of Stowe, VT, and are nice enough to let us stay with them during ski season 🙂 We’re looking forward to a great weekend of skiing, though we will undoubtedly get our butts handed to us on the slopes by my ski bunny brother and sister in law. The mountain is absolutely beautiful, and perhaps I’m biased, but I think it’s the best mountain in all of New England. And of course, they do get a ton of snow, so it makes for great skiing. This will probably be our last ski trip of the 2011 season, so we have to go out with a bang!